Russian Hebrew scholar and author; born at Byelostok, government of Grodno, in 1803; died there Nov. 14, 1869. He devoted himself especially to the study of the Haggadah; and in addition to a long series of exegetical notes which he published in various periodicals, such as "Ha-Maggid," "Ha-Meliẓ," and "Ha-Karmel," he wrote two books: "Mish'an Mayim" (Wilna, 1861), a guide to the true meaning of the haggadic passages in the Talmud and Midrashim; and "Me Mikal" (ib. 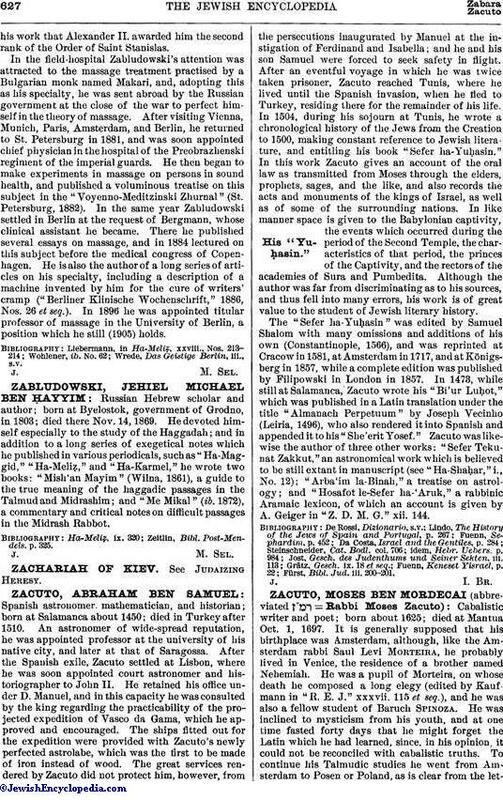 1872), a commentary and critical notes on difficult passages in the Midrash Rabbot. Zeitlin, Bibl. Post-Mendels. p. 325.